Our office has tried the new X-PUR CariØ, and here are our thoughts! Great taste, gentle toothpaste, and effective at preventing cavities. It is a non-fluoride toothpaste, with a new 25% Xylitol formulation. It helps control the cavity-causing bacteria, and prevents plaque formation. It works during the colonization and adhesion of the caries process to reduce the cariogenic bacteria load. For many years, studies have shown that the cavity-causing bacteria are not able to metabolize xylitol, which results in an absence of lactic acid and polysaccharide production. This toothpaste is a good alternative to a fluoride toothpaste for those wanting the non-fluoride option. It is used just like traditional toothpaste… Brush 2-3 times per day with a small amount, and expectorate afterwards. Ideally do not rinse your mouth out with water for 30 minutes to allow the gel toothpaste to work on your teeth. The toothpaste has a nice gentle mint taste, and I have been told they will be coming out with a bubblegum flavour sometime this year. You can purchase this toothpaste at our office, London Drugs or Shoppers Drug Mart. Ask your North Vancouver Dentist with any questions about this toothpaste or other xylitol products which can help with your oral care. 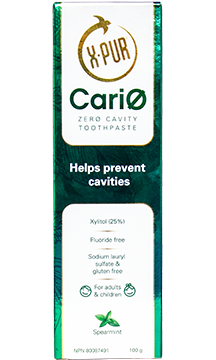 For more information, visit https://www.oralscience.com/en/products/cari0/ and learn more about this 25% xylitol toothpaste.